Clean, safe, tough and extremely economical chick brooder the larger EcoGlow 50 is ideal for up to 50 chicks or ducklings and suitable for any waterfowl or gamebird chicks. The EcoGlow 50 only uses 60 Watts (a fraction of the electricity of typical suspended infrared lamps) because the chicks are in contact with its warm underneath surface. 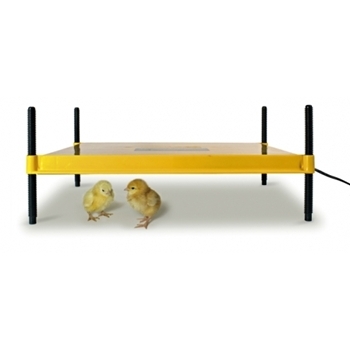 Different sizes of chicks can be accommodated thanks to the 4 adjustable legs which allow use at a wide range of heights. One end of the panel may be set lower than the other. An indicator light confirms the brooder is connected. The low cost of the EcoGlow makes it possible for larger numbers of chicks to be warmed by multiples of brooders. For brooding a smaller number of chicks see the smaller EcoGlow 20 chick brooder. I really really like this unit because you can easily adjust the legs to exact height you want. You can have one side down for smaller chicks and the other side up for bigger chicks. It fits maybe 50 banties, but definitely not 50 LF chicks. I have 2 of the smaller chick warmers. I would definitely go with the larger one if you have room in your brooder. The smaller one are ok but a little more difficult to adjust height. The first one I got did have a small crack by leg. It was still useable but I reported and they sent me a replacement right away. The EcoGlow chick brooders are designed to be extremely economical to use, especially for small numbers of birds. A typical heat lamp runs at 250 watts compared with 60 watts for the EcoGlow 50. Considering the brooder is on 24/7, this is an important saving. To get the best use from this low power unit it is important to understand that there is no big margin of ‘spare’ heat and some precautions need to be taken depending on the ambient temperature in the room, and on the age and number of chicks –and the size or species. First, it is better to have the unit on a lower height setting, if in doubt. The chicks will move away from the EcoGlow if they are too warm. If brooding very young quail or very small numbers of any small birds, it is a good idea to confine them in a cardboard box at least twice the size of the EcoGlow, but put the brooder against one side of the box so that the birds can only enter on the other side. This conserves warmth under the brooder but still allows birds to move freely out into the open as they wish. Another useful trick is to put the whole box on a slab of 1” Styrofoam to reduce heat loss from the bottom. In an extreme case, it can be useful to remove one end of the EcoGlow so that it rests directly on the floor. The other end is best at the middle or higher position. This gives very small birds to option to touch the warm surface or adjust their position for maximum comfort. For larger numbers of birds, two to four EcoGlow 50 can be assembled side by side. Above four units, it is probably better to leave a gap between units for birds to exit freely.